Some of the best things in life are also the most simple -- like ice cream, puppies, and the movie Jaws -- and this is especially true for breakfast tacos. 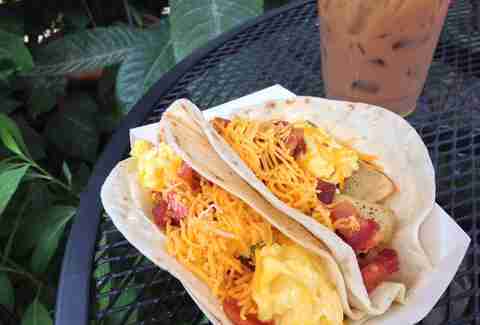 Austinites can’t get enough breakfast tacos. We wait in line, food-style, photograph, post to Instagram, and review, and some of us pay exorbitant delivery fees to be able to unwrap these foil-wrapped presents in our jammies. 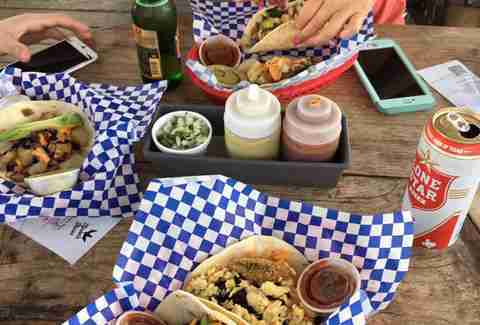 Luckily, Austin’s home to many great taco joints -- and a handful of truly exceptional taco joints, if you’re looking to explore beyond the Torchy’s bubble. Flour or corn, eggs, chorizo, pork belly, Takis... whatever shape your ideal breakfast taco takes, there’s a place that’ll provide it for you. 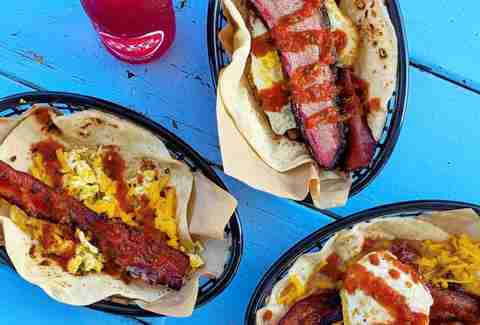 Here is your cheatsheet to Austin’s very best breakfast tacos. When owner Simon Madera resurrected Taco Flats -- which shuttered in the early '80s -- its brand went from landmark dive serving cheap beer and a 99-cent plate of taco meat and fixings (aptly named the “Hobo Plate”) to a vibrant neighborhood eatery on Burnet Road. In place of vagrant-inspired fare, Taco Flats now offers a mezcal and tequila-focused cocktail program and a from-scratch menu of (mostly) tacos and appetizers inspired by Simon’s Rio Grande Valley upbringing. The restaurant’s breakfast tacos, served starting at 11am, are a highlight thanks to handmade corn AND flour tortillas (a true rarity) and fresh ingredients like Vital Farm organic eggs, and the Michelada Ojo Rojo is hands-down the best michelada in Austin. More recently, East Sixth Tejano bar Kellee’s Place was purchased by Madera and transformed into La Holly Cantina, home to the Taco Flats Airstream, DeeDee, and an icehouse that caters to both newly initiated Eastsiders and the original patrons who kept Kellee’s alive all those years. Chilaquiles, the cousin to migas, are fried tortillas quickly simmered in salsa then topped with a fried egg. Taco Flats’ Chilaquiles DF are topped with grilled jalapeños, crema fresca, cilantro, and queso fresco. Brothers Miguel and Dani Cobos have come a long way since the inception of Vaquero Taquero, the road littered with strange turns -- raising funds by trimming weed in California, fatal acid trips, living in a van, zig-zagging the border while doing taco research, and dealings with a bonafide trompo con man. And while the juicy al pastor sliced from an enormous trompo is the best in Austin, it’s hard to resist the simple goodness of their breakfast tacos, made with handmade corn and flour tortillas. Miguel and Dani currently operate out of a truck in Hyde Park, but are in the process of securing permits for their first brick-and-mortar location in November, which will include a raspa bar! Get excited. The bacon and egg taco is elevated with the addition of crispy pan-seared Oaxacan cheese and a fresh-from-the-comal tortilla. 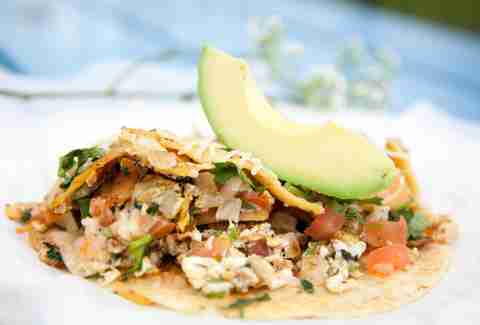 Regular folks and extremely famous television personalities agree: Veracruz All Natural has amazingly delicious tacos, especially the migas taco. For that, you have Reyna and Maritza Vazquez to thank; the sisters and co-owners were born and raised in (wait for it) Veracruz, Mexico, where they combined a passion for their culture with fresh, organic ingredients, forming a successful business with five thriving locations. For veggie diets, La Reyna rules (egg whites, mushrooms, carrots, spinach, cilantro, onion, red bell pepper, Monterey Jack cheese, avocado, easily modified to be vegetarian or vegan). Taking out-of-towners here is a treat: Watching their eyes light up as they sink their teeth into the first bite makes the occasional wait time so worth it. 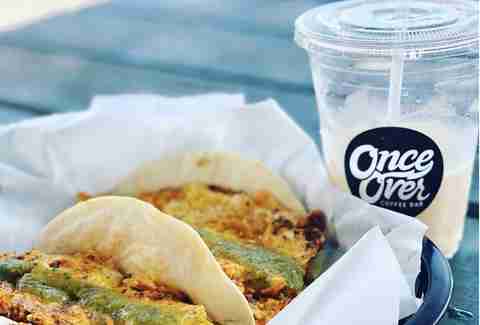 Granny’s Tacos may just be the next Veracruz All Natural; homestyle tacos and word-of-mouth have created a growing buzz the modest operation is worthy of. Husband-and-wife owners Maria Rios Vega and Armando Vazquez share duties in the repurposed ambulance, Armando at the window and Maria cooking recipes passed down through generations of family. You can find Granny’s Tacos in the lot between Revival Coffee and Kebabalicious. The handmade corn tortillas are the stars here, and they especially shine in Granny’s chilaquiles taco, with tortilla strips simmered in your choice of red, green, or mole sauce, onion, chicken, sour cream, and melty Mexican cheeses. The neon yellow trailer in front of Once Over Coffee on South First is small -- like, tiny -- but its loyal customer base is enormous. The family-operated El Primo makes classic breakfast tacos that cost only $2.25, with corn and flour tortillas that are purchased locally but bear the flavor, texture, and imperfect edges of a made-in-house 'tilla. El Primo opens at 8am, but unlike other taco spots, stays open until 5pm Monday-Thursday, 4pm on Saturday, and 10pm on Friday. Also worth noting: El Primo is closed on Sundays and only accepts cash, so plan your brunch runs accordingly. As a South Texas native, I know barbacoa is the ultimate breakfast taco, and this one is done right. The tender texture of the meat is punctuated by their house salsas, a tangy tomatillo, and smoky chile de arbol. After 70 years of daytime-only service, the Tex-Mex institution’s new owners have extended its hours to 10pm every day. Cisco’s new all-day menu is full of local favorites like biscuits, huevos rancheros, and tacos available at any time. 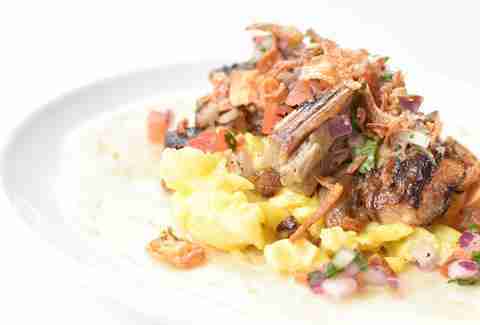 The migas tacos are a breakfast (and dinner) favorite: El Milagro tortillas made in nearby San Marcos are filled with crisp tortilla strips, eggs scrambled with tomato, onion, and cheese. Other tasty standbys include classic combos like potato and egg, chorizo and egg, all jazzed up with Cisco’s fresh salsa... and best of all? Old Austin is alive and well here, in the form of cheap food and a classic jukebox selection. 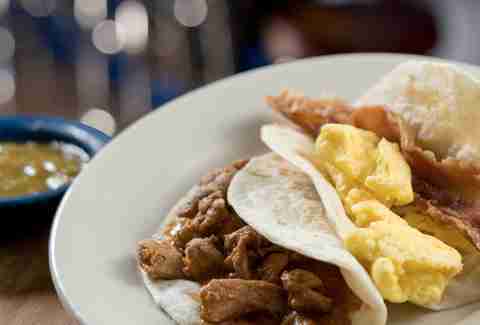 A flour tortilla filled with spiced pork and fluffy eggs go perfectly with Cisco’s seemingly bottomless coffee. Add cheese and salsa! 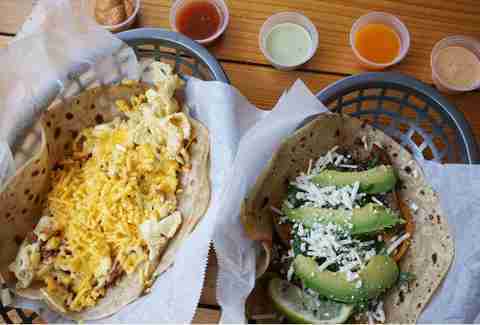 Taco Joint's breakfast tacos are dreamy for a few reasons: The portions and prices are generous, and the vegan flour tortillas have the flavor and texture of the real deal. Oh, and there’s also a salsa bar with eight colorful sauces that range from a cream-based smoky chipotle to a bright orange habanero blend that will certainly put hair on your chest. While the simple two- or three-ingredient breakfast tacos are always a good choice, we happen to be fans of the steak and egg taco -- made interesting with the addition of shredded smoked Gouda. The very filling migas open faced taco (corn tortillas strips, egg, tomato, onion, fresh jalapeño, queso, and queso fresco served on a corn tostada) is one you don’t want to sleep on. Squeeze a lime and go nuts at the salsa bar. Crispy pork belly, scrambled eggs, fresh avocado, fried shallots, and tomatillo salsa are served in a warm tortilla for a very satisfying bon voyage. What a delight it was when Fresa's opened their second location in the former Freddie’s Place -- the food is fresh and flavorful, the inviting space now bright and sans unruly children, and the picture-perfect cocktails are potent and well-made. Well, their breakfast tacos are no different. 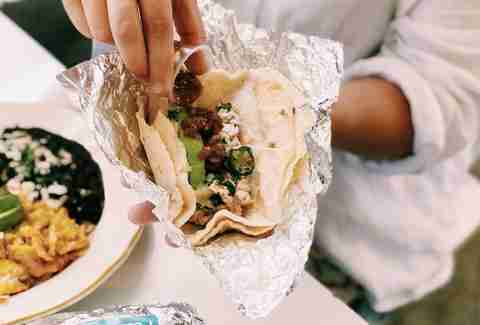 From 8-10am on weekdays (and 11am on weekends), foil-wrapped tacos with colorful labels are available from both Fresa’s locations, which means you can drive-thru or grab to-go from the window. We’re fans of The Margie (steak and eggs, rajas, charred onions) and The Flaco for a healthier option (black beans, potato, avocado, cabbage, rajas, pico de gallo, corn tortilla). And, if you arrange the tacos and colorful salsas juuuust so, they’re quite photogenic. The Tricky is literally a tricked-out migas taco; fresh ripe avocado, crumbly queso fresco, and cilantro are the perfect accessories. Joe’s no-frills charm is undeniable: Selena playing on the jukebox; Pepto-colored pink cake on display in the bakery, and oversized red plastic cups on every table. Don’t expect fancy coffee or tacos with quirky names; just simple Tex-Mex goodness South Texas natives grew up on. Be sure to try the handmade flour tortillas -- they’re thick, warm, and leave a bit of flour on your hands -- the flavorful refried beans that are definitely not vegan, and Joe’s famously crispy bacon that’s dredged in flour before being cooked on the flat-top grill. 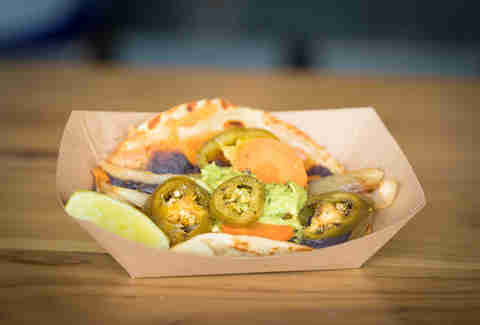 Oh, and then there’s the fiery salsa verde: It’s brutal in the best way. 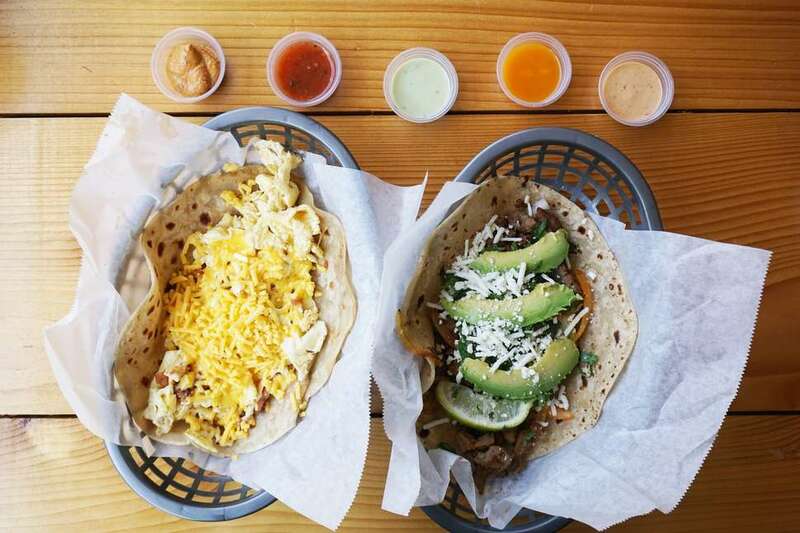 These components add up to some of the most delicious Tex-Mex breakfast tacos in town. Trust. This selection highlights the crispy, almost-battered bacon and tortillas that are so soft and fluffy they’d make a fine comforter for a tiny man. Add a pinch of salt, and don’t be shy with the salsa. 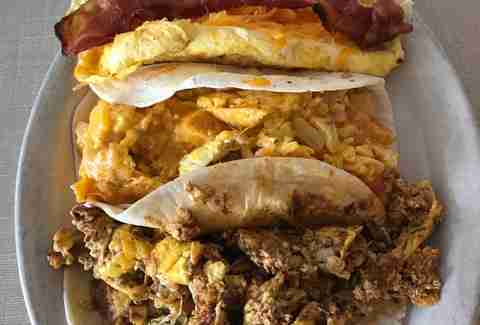 From 7:30-11am, Valentina’s offers three customizable breakfast tacos that embody their genius mash-up concept. The menu may seem small, but the tacos are not; oversized, hand-rolled flour tortillas serve as the foundation for these hearty handfuls. They’re packed with traditional ingredients like eggs, beans, potatoes, and bacon, and then topped with juicy smoked meat -- the best of both worlds! San Antonio native Miguel Vidal, his wife Modesty, and his brother Elias Vidal own and operate the trailer, named after Modesty and Miguel’s oldest daughter, Valentina. A fried egg, roasted potatoes, refried beans, bacon, tangy tomato serrano salsa, and melt in your mouth brisket (or pulled pork) piled onto a freshly made flour tortilla, the Real Deal Holyfield is the size of an open burrito. This whopper of a meal is one that we suspect only Holyfield himself could eat more than one of. Tamale House East is part of a Tex-Mex legacy: Its owners are the nieces and nephews of Robert "Bobby" Vasquez, the late owner of the now-shuttered Tamale House on Airport. The East Seventh restaurant carries on the tradition of delicious tacos and great prices, but ups the ante with horchata cold brew, brunch booze, and a lush patio. While the locally purchased flour tortillas don’t compare to freshly made, the breakfast taco fillings are well seasoned and possess a homestyle simplicity we love: fluffy eggs and fried potatoes sprinkled with pepper, thick-cut bacon, and fresh salsas. Why make tough decisions? With potato, egg, bacon, and cheese, The #5 covers all the bases. Owners Tyson and Cherry Blankemeyer have a wild backstory -- they fled their home and restaurant in Monterrey, Mexico, after cartel violence and subsequent militarization -- and a commitment to keeping Austin’s tacos weird. Tyson’s has gained attention for their stoner-approved tacos as much as their quirky promotions; for every dollar spent here, you get a point, and 200 points earns you a namesake taco. A few years back, playing a tune on your ukulele resulted in free tacos. About half of the unique breakfast tacos are named after loyal patrons and we encourage you to create your own adventure with ingredients like fried avocado, cremini mushrooms, and even Takis. Need-to-know info: TYSON’S IS OPEN 24 HOURS A DAY, 7 DAYS A WEEK. You may now rejoice. The King George takes ever-popular migas and adds crispy-on-the-outside, creamy-on-the-inside fried avocado, bacon, and creamy sriracha. Very regal. 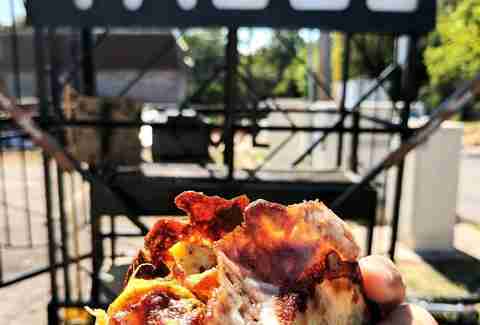 When you think about breakfast tacos in Austin, Dai Due Supper Club and Butcher Shop’s hyperlocal, farm-to-table concept probably doesn’t come to mind. Their casual counter at modern food court Fareground may surprise you, however; Dai Due Taqueria’s perfect, hand-patted flour and blue corn tortillas stand out as arguably the best in Austin. The tortilla-making process is simultaneously traditional and modern: Locally grown heritage varieties of dried corn are nixtamalized with post oak ash from their grills and ground into blue masa, and flour is sourced and milled locally and mixed with house-rendered lard. Grab a brunch taco on weekends from 9am-3pm: the small menu is full of hits, and they all pair nicely with an agua fresca or brown rice and pecan horchata. Typically, greasy pork is swapped out for local wild boar chorizo, crispy potatoes, refried black beans, cilantro, and your choice of fresh-made tortilla. Rosita’s is a brick-and-mortar and a taco truck, both of which are found in front of a bingo hall on East Riverside. 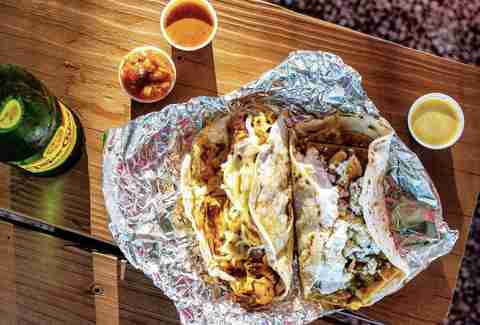 While Rosita’s is known for its al pastor carved right off of the trompo, the simple goodness of the breakfast tacos has grabbed the attention of taco enthusiasts and food writers alike. Powdery, handmade flour and crispy-yet-pliable corn tortillas cradle various combinations of eggs, meat, potatoes, and cheese; the portions are very generous, and most are under $2. And, there is an app for ordering online! Handmade tortillas arrive loaded with (miraculously non-greasy) chorizo and fluffy egg; add cheese, a squeeze of lime, and fresh salsa! Anastacia Uriegas is a San Antonio native living in Austin whose childhood diet consisted of mostly bean and cheese tacos from Taco Cabana. Follow her very adult adventures in heirloom grains, artisanal legumes and cave-aged cheese at @anaurie.